← What do i.e. and e.g. mean? Many of us spend hours on Facebook. Seeing as you’re already there, why not use some of this time to help with your language learning? You’re much more likely to do it if you’re on the site already, than to make time to look for information about English elsewhere. What are the different types of Facebook groups? Some groups are open, which means that everyone can read the posts, irrespective of whether they’re a member. Often, language groups are closed so that only members can read the posts. In closed groups, anyone can find the group, but only members can read what has been written. Some language learners feel more confident about writing in closed groups, because fewer people can see what they write. There are also hidden Facebook groups, but these are invitation only. There are groups on all kinds of subjects. If you’re learning English, why not try to find a group about your favourite hobby, sports team, local events or for people with similar interests to you. You just need to make sure that it’s in English. It doesn’t matter if you’re the only non-native speaker there. I think I was the only non-German speaker in a forum about dogs. It didn’t matter. My messages were far from perfect, but people understood what I wanted to say and as I took part in discussions about our dogs, I learned new words and found people to talk to in German. I was interested in the subject, so I was motivated to go and find out what was happening in the group. This was before I opened a Facebook account, but the same rules apply. 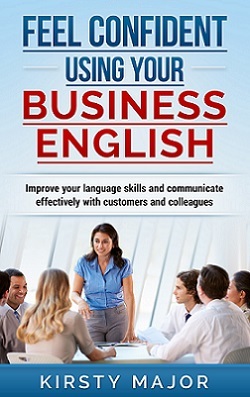 If you want to improve your business English, you can also look for groups on your area of work. Many people believe that Xing and LinkedIn are the only sites that have such groups, but Facebook group on business topics are becoming increasingly popular. There are a number of bilingual Facebook groups which function as a kind of group tandem. For example, in a German/English group, German speakers help the English speakers with questions about German, and English speakers do the same when questions about English come up. There is no teacher, but the members of the community help each other. I have one of these groups for people who want to learn English. It’s called “Englisch mit Kirsty – verbessere Dein Business Englisch” and it’s a place for people to come together and practise their English. I also answer general questions, post tips or information, and we have theme days such as “Thursday – things you want to know”, and “Wednesday – words and their meanings”. What’s special about Facebook groups and how can they help you? 1. There are plenty of Facebook pages about learning English, but you won’t necessarily see everything that they post. If you follow a group, the group’s posts are more likely to appear in your feed. 2. A group is like a community. Rather than one person or a company interacting with fans, you can be part of a community of like-minded people who want to learn about the same thing – whether that’s a language or a common hobby. 3. Teachers or other group members can help by answering your questions or explaining things that you want to learn. 4. It’s an opportunity for you to practise reading and writing with learners or native speakers. This can feel more real or relevant than doing a writing exercise for the sake of writing. 5. You might find some new friends with whom you can practise your English. 6. Being part of a group helps to keep your motivation up on days when you feel that you can’t be bothered. This might be because you’re interested in what’s happening in a particular thread, or it may be that other people help and encourage you to keep going. 7. You may think that you don’t have time for English, but if the groups posts are easily accessible in your feed, you are more likely to read and interact with them – and do some English practise at the same time. 8. If you’re in a group with other learners of English, they might know of good learning resources that you haven’t discovered yet. 9. If you’re in a group about a hobby or interest, you’ll be able to learn vocabulary specific to that topic. You may not find this in more general books about learning English. 10. You’ll probably find that the more you interact in English, the more you will grow in confidence and develop your vocabulary. So, whether or not you join my group, I hope that this has given you some ideas as to why Facebook groups can be a really useful tool to have in your language-learning toolkit. Sure. Mastering English might not be the only thing that can give us a plus value in the workplace or school/college. We do need other skills, like programming, design, and etc according to the job requirement we apply. Maybe if we major in Math, it should be good if we master Math. But of course, mastering English will absolutely be a plus for a person compared to those we don’t master English. Well, this blog is about learning English, so naturally the focus is on improving English language skills. However, I agree that if you want to develop other skills, there are plenty of opportunities to find communities of people online who share your interests or educational goals.